James Teel, right, Past Grand Master of the I.O.O.F. Grand Lodge of Texas, presents an award to Ned Johnson, left, who in 1923 was a resident at the I.O.O.F. Orphan's home in Corsicana. I want to thank all of the members of the Independent Order of Odd Fellows of Texas. I am very humbled that you had faith in me to let me serve you as your Grand Master. I will never forget the privilege I had working for the Order, to meet so many faithful Brothers and Sisters of our Order. I was welcomed at the lodges all across the state. Since I was elected Grand Warden, (not due to me) we have had some very positive growth. First, the addition of the new wing to our Nursing Home - the wing is completed and approved by the State for new residents. Second, the renovation of the white building - the first phase will be complete or near completion by the time of this report. The Event Center has been started and we can look forward to the renovation of the existing portion of the Nursing Home. When complete, all of these protects will add to the future of Odd Fellowship in the Jurisdiction of Texas for years to come. We should all be proud of these projects. A big thanks to all the members who have worked long, hard hours to make it all happen. Even before being elected to the Executive Committee, I was concerned about the loss of membership for non-payment of dues in my home lodge. I am still concerned about this in our Order in general. We must stop the hemorrhage of loss by non-payment of dues. We must help our members stay in the Order. We can help, and the lodges can help by accepting partial or quarterly payment of dues for members to stay current. If we put forth the effort to retain our members, new members will build our membership. We must become more active in community projects by having open meetings with meals and invite prospective members in order for them to know what we stand for and make them want to join Odd Fellowship. We need to help with 'Meals on Wheels', 'Manna Movers', helping people who need help but cannot help themselves, and providing scholarships for local high school students. ​We must work harder to stop weak lodges from demising and to add new lodges. We must revive our Order for the future. If we don't leave more to the members than has been left in the last several years, the members will have nothing to work for. So please, let's do more now so they will have something to work with. 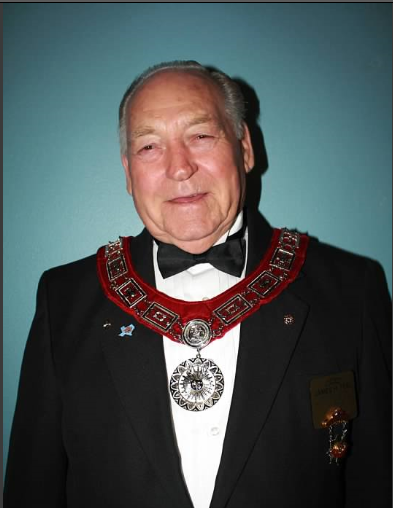 When I was installed as Grand Master, I promised I would work for the good of the Order and also to improve relationships of committees and members for the increase of membership. I feel some progress has been made but there's still room for improvement. I wish greater strides had been made. I will continue to work on these items with our incoming Grand Master, Brother Clifton Cates. It is a must that we turn around the loss of members. We have got to increase our membership for the existence of Odd Fellowship in Texas. It has been an honor and a privilege to be Grand Master, as well as a pleasure for me. Some of the highlights are as follows: Being installed as Grand Master and the privilege of laying the Wreath at the Tomb of the Unknowns. This was a feeling I will never forget as it was a very moving moment. Also, attending the Sovereign Grand Lodge in Kansas City, Missouri as the Representative from the Grand Lodge of Texas. It was interesting to see the Sovereign Grand Lodge conduct their session. I would like to take this time to thank those who have helped me during my term as Grand Master. First, to my wonderful wife, Geneva, who has been by my side these past three years. 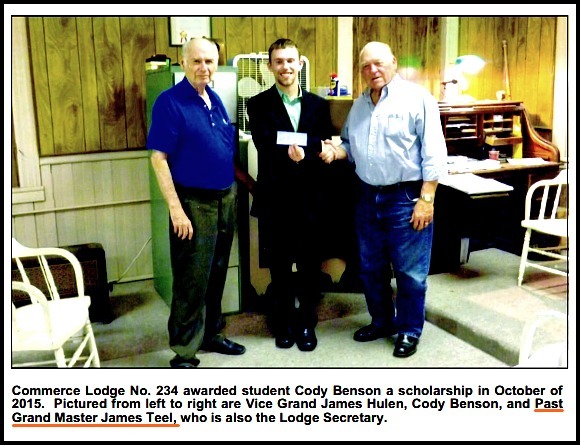 I appreciate my family for understanding my absences at family affairs, and a special thanks to my home lodge, Commerce Lodge No. 234 and to all the members of the Odd Fellow Lodges of Texas. Thanks to the Grand Lodge Officers, Brother Clifton Cates, Deputy Grand Master; Jerry McGee, Grand Warden; James Curtis, Grand Secretary; Frank Ford, Grand Treasurer; and Danny wood, Junior Past Grand Master. Without the help of these brothers, it would have been much harder. A special thanks to these brothers who have gone the full length for the good of the Order. They have helped me the full time of my term. I pledge to support the incoming Grand Master, Brother Clifton Cates, and wish him the best of luck for the ensuing term. I thank the Rebekah Assembly for electing Sister Dorothy Dare as Grand Warder, as my running mate. We have worked together for the good of the Order for the past three years. Thank you, Dorothy, and the best of luck in the future, God bless. I regret that this year has to come to an end, because (as Brother Danny said) I was not able to accomplish all I had hoped to do. As Junior Past Grand Master, I will continue to work for the Order. I will support Brother Cates as I can during his term. Good luck to you and the committees of the Order. May God be with you and guide you.